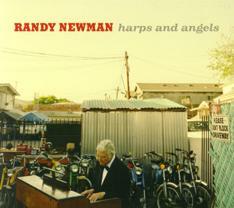 George Graham Reviews Randy Newman's "Harps and Angels"
Randy Newman is certainly one of the more enduringly quirky and distinctive singer-songwriters in music. For most of his career, he has been the critics' favorite, and his songs have been covered by others. but he has on only rare occasions achieved much public recognition as a performer. But along the way, he has followed in the footsteps of his uncles, Alfred and Lionel Newman, to become successful Oscar-winning film composer, something that has kept him busy for most of the last 25 years or so. Among his notable scores were for several l of the Pixar animated features including "Toy Story." This year marks the 40th anniversary of the release of his self-titled debut album, and perhaps to mark the occasion, Newman has issued his first recording of new songs in nine years, called Harps and Angels. It's hard to believe that it has been over 30 years since his one big pop hit, the satirical Short People, a song that famously divided the public between those who got the joke and those who didn't, such as the Maryland state legislature, which tried to ban the song. Newman's last recording was a reexamination of a batch of his best-known and more obscure songs in a solo piano setting, the way he often performs. Now the 64-year-old Newman has finally created a new batch of songs. Actually, one of them, called A Few Words in Defense of Our Country was issued last year on the Internet as a download. And movie music he does as a day job had found its way into the arrangements on this CD. The musical setting evokes a kind of theatrical feel, or perhaps evoking the aura of old time New Orleans, a city in which he spent a lot of time as a youth. But those who look to Newman for sardonic wit, and his kind of charming cynicism, will not be disappointed. He creates another group of his less-than-admirable characters to serve as narrators, but also delivers some social commentary performed in his style that can only be Randy Newman. Though he has worked in an orchestral setting going back to his first album 40 years ago, this time, there is a distinctly nostalgic feel to the musical atmosphere, which provides a stark contrast to Newman's famously limited vocal pitch range and nasal quality. He can manage to sound both poignant and acerbic at the same time. He explores such topics as old fashioned love, social commentary, and the pursuit of money, which has been a topic on which he has successfully drawn before. Randy Newman's new 13th album, coming 40 years after his debut, is another gem by a one-of-a-kind singer-songwriter. While my initial impressions are that it might not be Randy Newman's best album ever, there is a lot of depth and many layers to the songs, and so it is a recording that is likely to grow on one. Newman is still at the top of his game, and the vaguely nostalgic-sounding orchestral arrangements he wrote for the CD add a lot to it, and frame the songs very nicely. Though there are ten songs, most are rather short, making their point and ending before they overstay their wecome. So the CD times out at less than 35 minutes. Our grade for sound quality is about a "B," with points deducted for the usual excessive volume compression that give the recording an in-your-face quality and undermines the subtleties of Newman's orchestral arrangements. Randy Newman seems to be happy creating music for films. But as a singer-songwriter, he just can't help himself. And even though it has been nine years since his last CD of new songs, he has once again applied his abundant talent as a musical storyteller to create a recording that will very much be welcome by his many long-time fans, and just might attract the attention of some of the people who know him for his scores for Hollywood films.